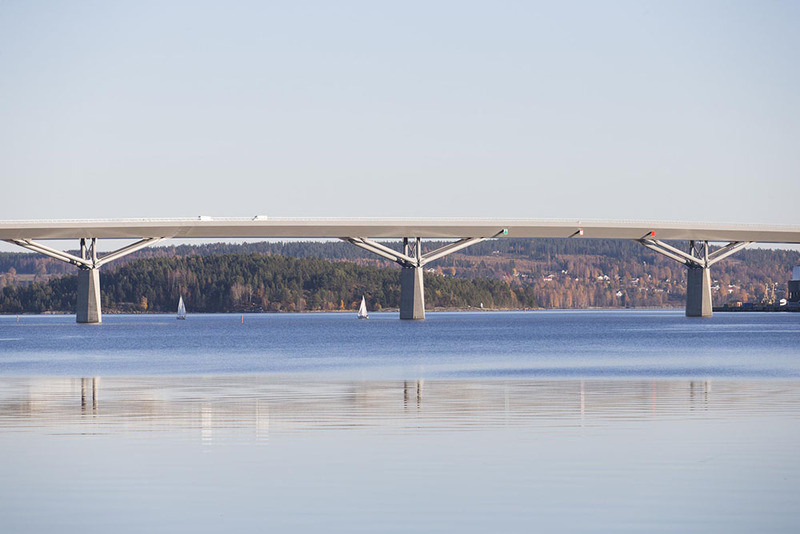 The bridge construction over the bay of Sundsvall is part of a major highway project consisting of a new trajectory for the E4 motorway, together with 33 bridges between Sk?nsberg and Myre in Sweden, adding up to about 20 km in length. 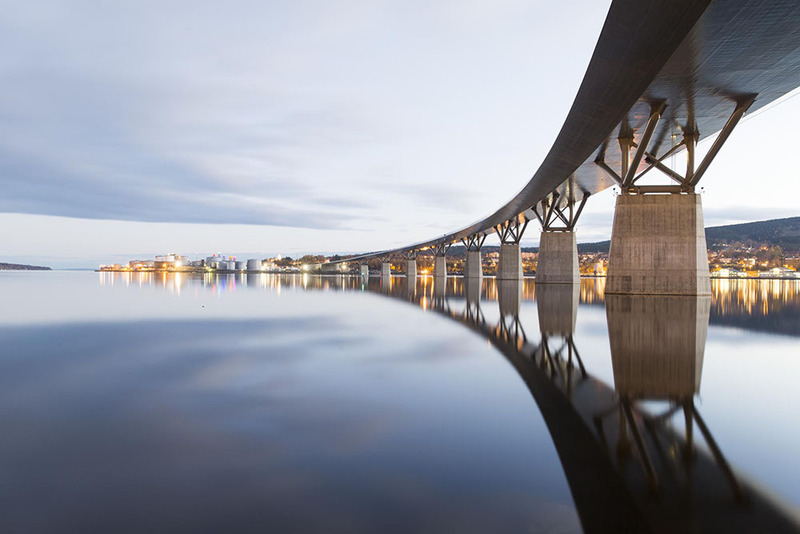 The project aims to enlarge the road network capacity, to reduce traffic jams and to redirect the traffic outside urban areas, thus bringing down the amount of emissions in Sundsvall and increasing road safety south of Sundsvall. 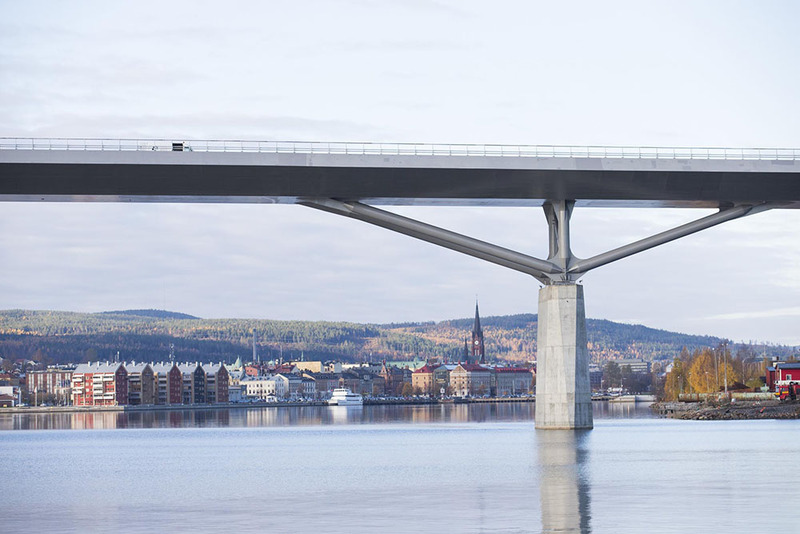 Moving the traffic outside Sundsvall’s city center has been studied for decades through a major road project and an urban development vision making it possible for the city to grow along the bay’s beaches and reach the water. A step towards realization was taken in 1995, when an open competition was announced. Our proposal “Dubbelkrum” won, but the commission has only begun in 2007, after more than 10 years of waiting due to the stall of the E4 project. The design relates directly to the city and the larger landscape. The main idea was to design a bridge that, despite its size, wouldn’t dominate but instead interact with its surroundings, and at the same time display a unique character and recognizable identity. 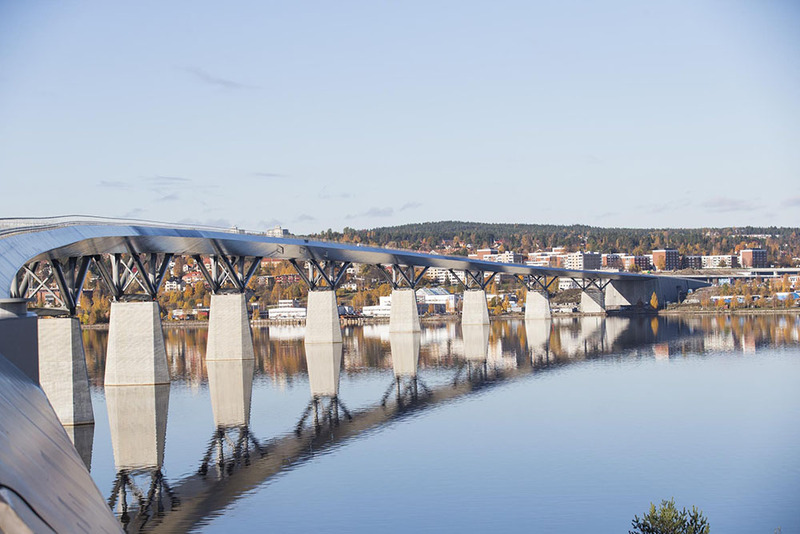 The bay of Sundsvall becomes a new urban room demarcated by the city center, the surrounding hills and the new bridge. The movement across the bay describes a smooth curve both in plan and in profile, with the maximum height at the center. The bridge forms a sleek and unified line running from abutment to abutment, without detaching ramps or other disturbances. 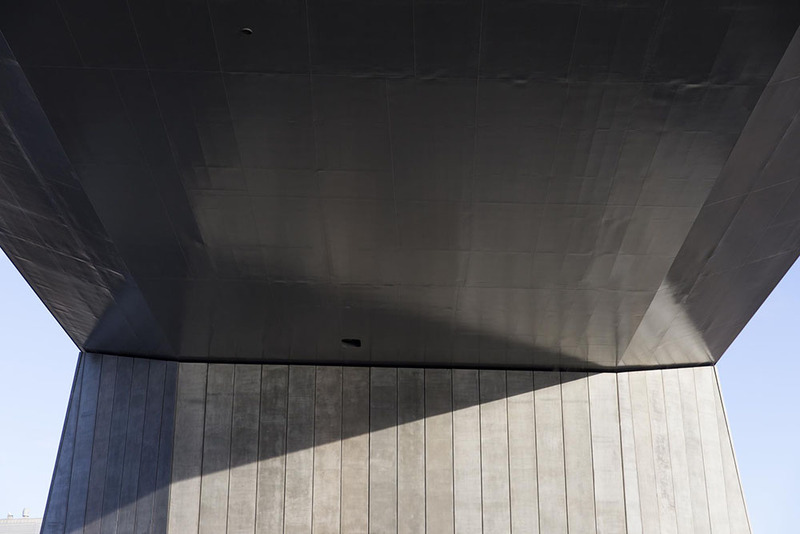 The bridge consists of three different elements that visually contrast with each other whilst composing a constructive whole. Massive faceted concrete piers raise out of the water to about two thirds of the total height. On top of them extends a structure of steel pipes that bears with ease and transparence a wing-shaped steel deck. 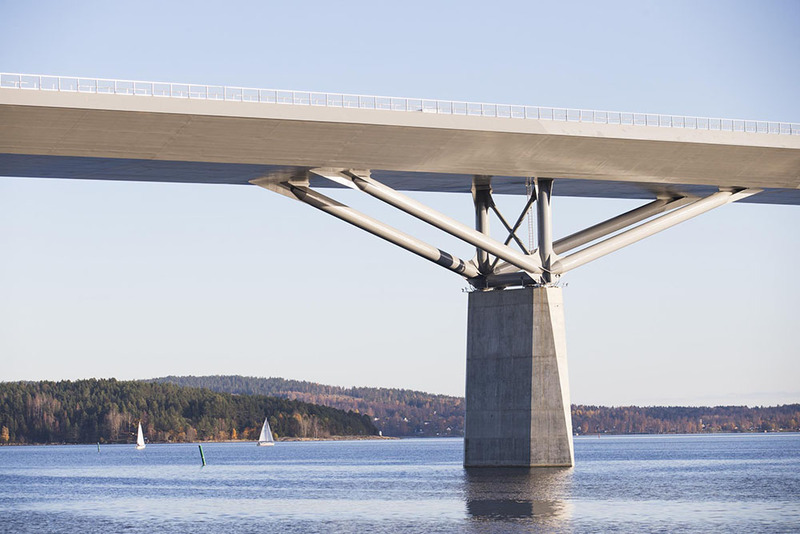 A successive change in size of the span widths, the piers’ design and the pipe structure’s height overlays the smooth curve of the deck. From the middle, the span length successively decreases from 170 meters to 88, while the bridge deck narrows down smoothly. The piers also diminish in size and the pipe structure adjusts proportionally in height. The abutments are made of powerful wall constructions that clearly mark the end of the steel deck. Their shape is inspired by the piers’ geometry, revealing a series of vertical grooves along the sides. E4’s stone cladded retaining walls run along the interchange ramps and are part of a coherent design for the traffic intersections. 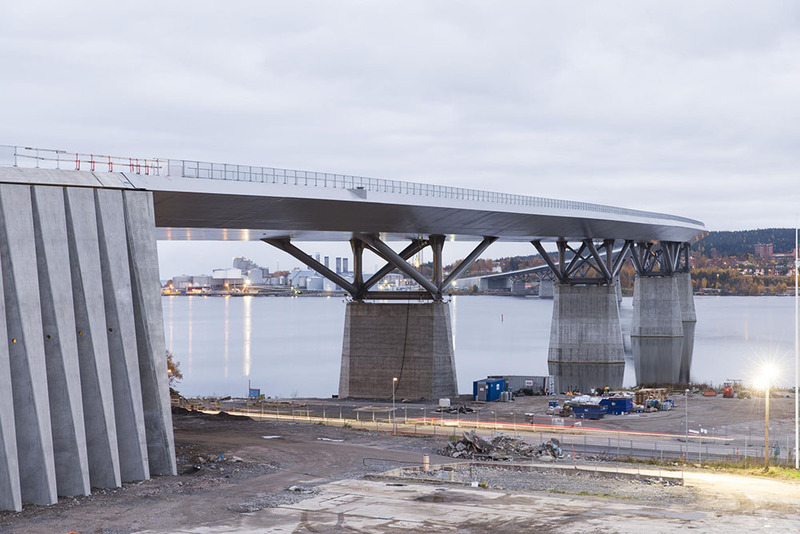 The lighting of the bridge is toned down, aiming not to distract focus from the city of Sundsvall and its surrounding hilly landscape. There is no lighting over the deck; instead was adopted an illumination solution positioned low on the bridge’s western side, along the pedestrian and bicycle way. Seen from the city, the bridge appears as a fine line of light running along its entire profile. Reflections are placed in the middle of the railing, acting as lamps. A soft lighting effect reveals the pillars’ tubular steel construction. All steel for this project comes from Europe. A total of a little over 300 steel parts have been produced in Bavaria and used for the span construction of the bridge. From Bavaria, the steel components were first shipped to Szczecin in Poland where they got assembled into larger bridge sections before being shipped on site in Sundsvall. 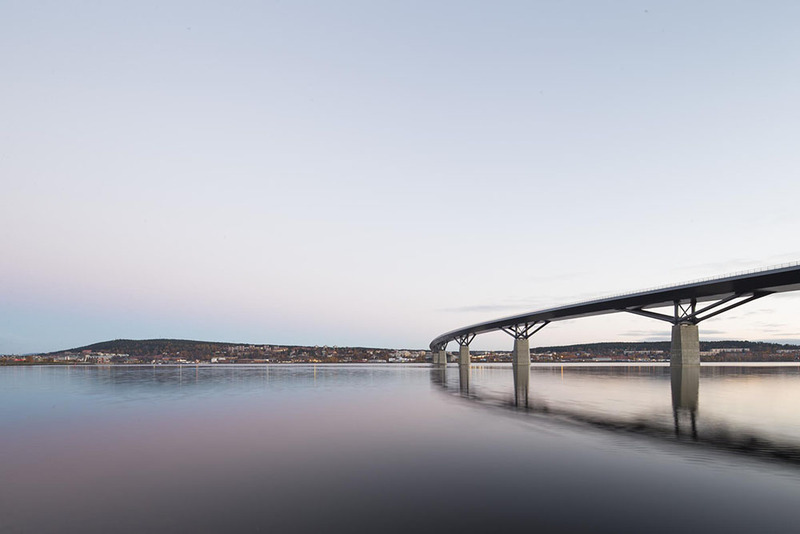 The Bridge of Sundsvall is made out of nine sections measuring between 90 and 160 meters in length and weighing up to 2 500 tons, the shortest being placed in the middle of the bridge. This variety is a result of the bridge’s double curvature, in both plan and longitudinal section. Each of the 9 sections comprises approximately 30 volumetric elements whose size was determined by the transportation barge’s capacity as well as by the lifting capacity existing in the workshop in Germany. The maximum size of these constructive elements is 6x6x25 meters.